London, England. Now living in NYC. I enjoy 9-minute miles with my dog! Over 60 marathons including many ultras. My longest race is the Tahoe200. 50 states in Sub-3. Many more ultrras including Hardrock 100 and Badwater 135! I run diabetes, diabetes does not run me! I love the purity of running, the community and where it can take you. It has truly changed my life. Marine Corps Marathon 2011. I was training for my first 50-mile race and ran MCM as part of my training. I’m not sure if I was relaxed or extremely fit, probably both, as I ran 2:45 and took 9 minutes off my PR. To give back. To share my love and passion of running with others to help them achieve their goals. Every pacing experience is unique and amazing. There is always someone you encourage to stick with you and fight and when you cross the finish line together, it is simply magical. Bad jokes and good pacing! I’m proud to always do my job well and make friends along the way. 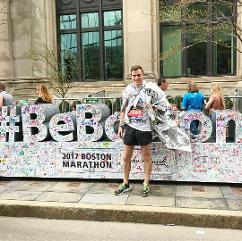 Enjoy everything the marathon has to offer. It’s an amazing experience and accomplishment to run 26.2 miles. Respect the distance, trust your pacer and you will be rewarded at the finish! 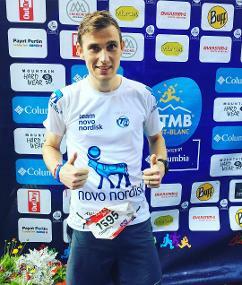 I run for Team Novo Nordisk. We are a global sports team made up of Pro Cyclists, Triathletes and Runners all living with diabetes. We aim to inspire, educate and empower everyone affected around the world. I am a Patient Ambassador for Novo Nordisk. 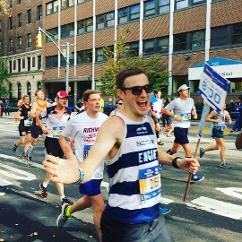 I am fortunate to travel the US and speak to diabetes communities about my story living with type 1 diabetes and how I use my passion for running to show others you can still achieve your dreams!